If you want real broadcast quality audio for less than £200, then listen up! A professional-class audio recorder for a thoroughly reasonably price. Brilliant. Voice recorders fall into two camps: there's budget digital dictation machines and then there's the broadcast digital recorders used by the likes of the BBC. The price gulf between the two types has always been quite wide but the Olympus LS-5 bridges that gap by offering genuine broadcast sound that will appeal to podcasters, journalists and musicians. The all-aluminium body of the LS-5 oozes quality and is surprisingly slender, being little larger than a mobile phone, albeit slightly fatter. The unusual design features a v-shaped pair of stereo mics mounted at the top of the LS-5. These beauties are incredibly sensitive, yet thanks to some very clean pre-amps there's virtually no hiss when recording, even in the most demanding conditions. Recordings can be stored on the LS-5's internal 2GB of memory or on an SD card. The card slot comes in very handy if you're using the LS-5's maximum quality setting of PCM recording at 96kHz at 24 bits, because it can gobble up the 2GB of memory in under two hours. The highest quality setting is best used with a very good external mic or even a line-in audio source from a mixing desk or something similar, such as a digital feed. Using the LS-5 is an absolute breeze. Press the red recording button once to slip into record mode and then press again to start the recording. All the stats you could require show up on the backlit LCD screen, which is a bit small if you need reading glasses. A Peak meter shows what's going on with the recording level and there's an LED which comes on when the recording level is peaking. As well as a manual recording level, there's also an automatic mode with a limiter if you can't be bothered to set manual levels. You can monitor recordings using a pair of headphones and when you've finished you can review your sounds using headphones or the small built-in mono speaker, just to make sure things have gone okay. However, don't expect to use the LS-5 as an MP3 player. Yes, it can play and record in MP3 format, but it's not designed for that sort of thing, so don't expect it to double up as an iPod. The really great news about the LS-5 is that it is, in nearly all respects, identical to the more expensive LS-11 model. The only cutbacks are the reduced internal memory and lack of a case and remote control. That makes it a compelling purchase. The amazing build quality and superb sound that those amazing mics can pick up. Great little extras like a tripod thread and the fact that it uses AA batteries for up to 16 hours of use make it a winner. The small screen can cause problems for those of us without perfect sight, and the handling noise that the LS-5 can occasionally pick up means you need to handle it with care or mount it on a mini tripod for long recordings. 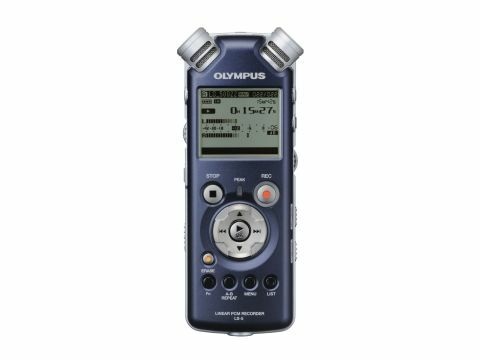 If you need to record high-quality sound, whether than be music, interviews or podcasts, the the Olympus LS-5 is the best value digital recorder that money can buy. Sure, you can spend more, but for most people the Olympus LS-5 fits the bill perfectly.